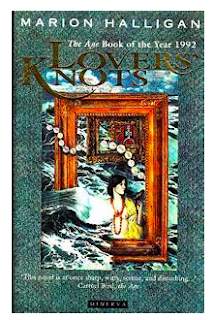 I have just finished reading Marion Halligan's The Age Book of the Year novel, Lovers' Knots. That's the 1992 Age Book of the Year and no, I'm not just catching up; I've read it twice before this. It documents one family over almost one hundred years but there's little that's sequential or predictable in this patchy but oh-so-engaging collage of who's who amongst the progeny of Ada and Albert Gray. Ada with her ample bosom, her tiny feet and bursting bunions, volunteers at the Mission of Seaman at Newcastle Port. It is 1911. At home she shares endless pots of tea with her son George while husband Albert, seduced out of respectability by the devil drink, lurks in the background, the object of Ada's disappointment and disapproval. Daughter Lily ditches George's decent friend Vic in favour of the vaguely sleazy Joe who supplants George in Ada's affections and in the household. It is not until page 170 in this book of 377 pages that we are given a family tree so we can see how George's and Lily's respective families develop. And yet this doesn't seem to matter. We are given chapters with headings and dates and then snapshots of who's doing what with whom. And there's no equity in who Halligan chooses to reveal. One of George's daughters, Veronica, gets lots of pages, focusing mainly on her long relationship with the photographer Mikelis with whom she makes love on the balding red velvet couch in the studio where he works for Neville of Newcastle. "She's unclasped the marriage pearls (a gift from the boring Martin) from around her neck, and her mind dances in tarty black dresses while the long legs of love flash like scissors through the daily silk of life." I'm not sure why I love this book so much. It skips from Newcastle to Canberra and back with an occasional detour to my old hometown, Murwillumbah. It skips around in time and certainly in style. And yet being temporarily lost doesn't matter, so engaging are the characters and what the author chooses to tell us about them. "So there you are, up to the fifth generation, or counting Ada the sixth. You could write a thousand page novel to get to this point; a block-busting, best-selling, negotiating the mini-series in however many digits, retiring to the tax haven of your choice .... Instead of a neat little chapter of what, seven pages? Six?" Cheeky thing! But I love her for it all. And the brief, final chapter is exquisite. There are a few books I've read more than once and I know this is true for many people. Cloudstreet, The Transit of Venus, Cat's Eye, Dinner at the Homesick Restaurant just off the top of my head. There was a period of my life where I read Wuthering Heights anew every year, maybe in the vain hope that this time Catherine would see sense and marry Heathcliff instead of the pale and soppy Edgar Linton. I suppose I stopped when I accepted that this wasn't going to happen. Having closed the last pages of Lovers' Knots, again with such satisfaction, I'm about to embark on A.S. Byatt's The Children's Book. At 615 pages it's not going to be quick so for now I'll just aim for reading it the once. This is definitely the next book I'm going to read this winter. Thank you for informing my reading. You might also like Matthew Condon's The Trout Opera, which also skips around Australia and covers a long period of time. Great story, wonderful characters and such a satisfying ending!